July has several reasons to be dedicated to all things French. First ,what could be more charming than the Haute Couture shows in Paris. Though some are held in larger venues, some still stick to that most charming practice of showing in the showroom with guests seated on guided chairs. Reminds me of “the olden days” when models came out with number cards and the head “vendeuse” called out the names like “Tour Eiffel” or “Place Vendome”. Soooo… charming. 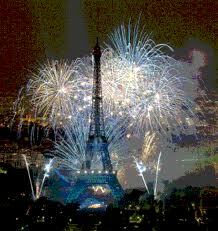 Then of course, we have Bastille Day around the corner. The French Fête celebrating the fall of the Bastille- prison, that is- If you believe Caroline Weber (see reading list below) everyone wore lovely couture to the guillotine-Oh those French! Sooo…charming . 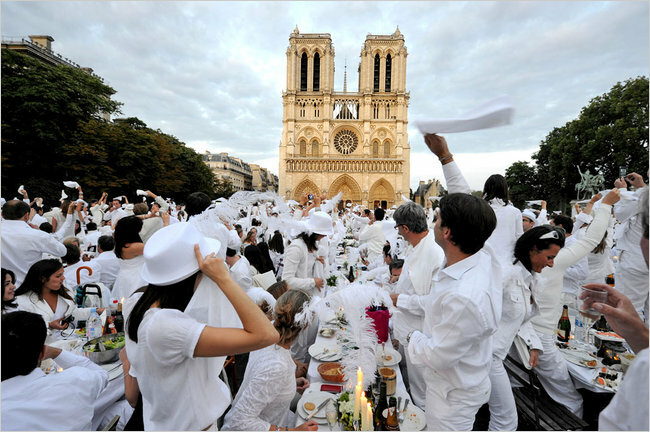 We have picnics, the French have the “Dîner en Blanc” or Dinner in White-10,000 Frenchmen & women & their chosen friends converge on the Cour Carrée of the Louvre in Paris (6200 according to the N.Y. Times) & 4400 (N.Y.Times) in the plaza in front of Notre Dame. 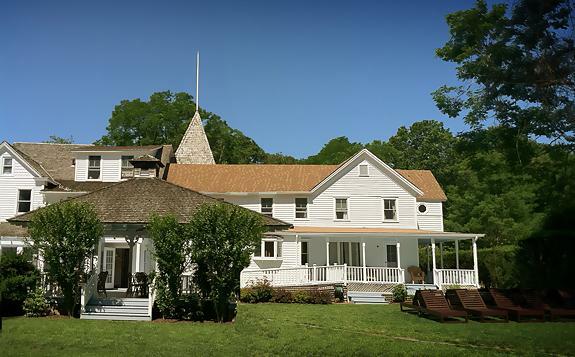 A secret feast held on June 16, where the guests had to wear white, bring their own gourmet diner, tables, chairs,silver & glassware-Candelabras optional.This very exclusive feast was started 20-some years ago. You meet up with your Head-of-Table at 8:00 P.M. and the site is revealed at the last minute-9:00. At midnight, after dinner and dancing, the revelers depart as if in a “Midsummer Night’s Dream. Sooo….charming! New York is organizing it’s own version for August 25th. Get on the list! Just be forewarned that Champagne is not allowed in public spaces in N.Y.C. Less charming…. Oh, those French-so charming and so seductive. The “Baisemain”-a kiss on the hand-gets me every time-last seen by me at last week’s wedding of Prince Albert of Monaco. Pres. Sarkozy of France, bowed and kissed the hand of Princess Caroline but not her sister Stephane. (you may only kiss the hand of a married woman-not gloved.) Find out this and everything you wanted to know about the French art of seduction in Elaine Sciolino’s new book Le Seduction: How the French Play the Game of Life . She’ll also explain why one must always dress well, even to go out to buy a baguette. The French, she says, use the word “seduce” when they mean “charm”. Now aren’t you glad you came to my Charm School. Speaking of kissing-Cartier’s new Women’s fragrance is called Baiser Volé (Stolen Kiss) capturing the scent of an iris in a beautiful bottle inspired by the company’s elegant cigaret lighters. Last chance to see the Alexander McQueen exhibit at the Met. Closing August 7th 2011. 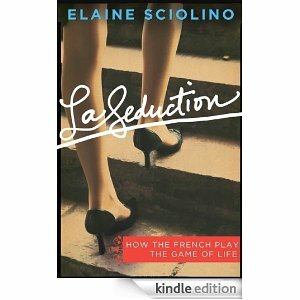 La Seduction: How the French Play the Game of Life. Elaine Sciolino tells us why “seduction” is at the heart of French life, and explains why one must always dress even to go out for a baguette. 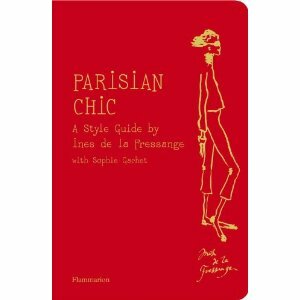 Then there’s Parisian Chic: A Style Guide by Inez de la Fressange, ex Chanel mannequin & “Parisienne” par excellence, in which she’ll divulge her secrets on how to dress, shop, eat and act like the perfect “Parisienne” Already a best seller in France, all this is packaged in a charming red volume. 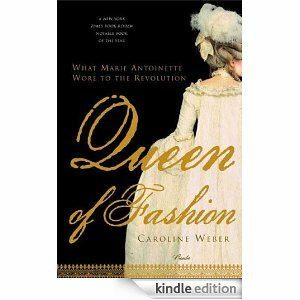 Speaking of Haute Couture, try Caroline Weber’s Queen of Fashion: What Marie Antoinette Wore to the Revolution wonderfully written and full of charm. 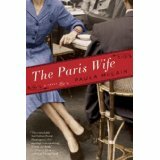 And if you prefer fiction to fashion try The Paris Wife by Paula Mc Lain. Written a novel,set in Paris narrated by Hadley-Hemingway’s first wife.